Masonite, also known as hardboard, is a type of lumber sheet that is mostly used in construction projects. Some of the uses include floor protection on construction sites to prevent floor damage, a paint surface for art projects, and as a work table surface. 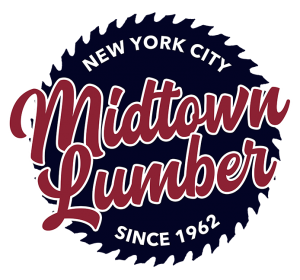 In Midtown Lumber, we use it as the surface for our table saw. The typical size masonite comes in is 4’ x 8’ (48” x 96”) sheets with a ⅛” thickness. For convenience, we also cut masonite into 4’ x 4’ sheets. The material is paintable but it is not stainable. If you are looking to use masonite on your next project, you should know that it can be nailed or screwed to other materials, but generally not itself. Have further questions about Masonite and when to use it?